From my early June trip to Lassen National Park. I love the color of the water of Emerald Lake and Lake Helen, which is more blue than the stunning Emerald Green of the other. Lake Helen was still frozen the first week of June, with the water just showing through in patches. There was a lot of snow so I had opportunity to paint the different whites to distinguish between them. 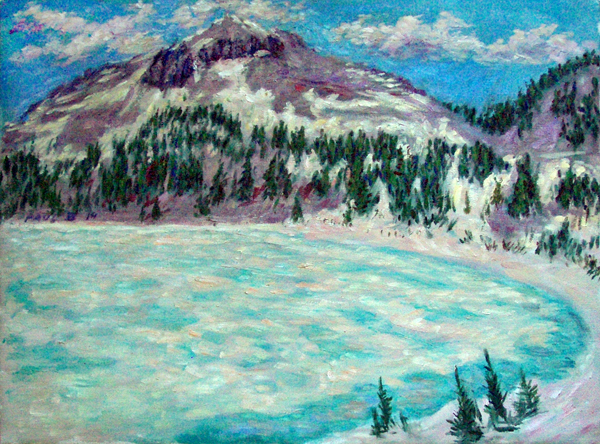 Notice the subtle orange tones on the lake to contrast with the blue green water peeking through, the pink tones in the foreground, setting the foreground and middle ground against the yellow tones of the snow, and darker violet rocks of Lassen Peak. PaulB's Pointillistic/Impressionist original oil paintings of National Parks and various prints and poster formats of a wide variety of subject matter by the Pointillistic/Impressionist oil painter from landscape/waterscape paintings, dance, sports, portrait, to classical figures, flowers, rock and roll, Brazil, National Parks, and Hawaii paintings and prints are available for purchase for as little as $24.95 for an 8"x 10" matted print on photo pape. Pointillistic/Impressionist Giclee prints of National Parks on real canvas or heavy watercolor paper are available. One of a kind National Parks embellished prints, which are Giclee prints retouched in genuine oil paint by PaulB. Unless noted PaulB's original Pointillistic/Impressionist oil paintiings are oil on canvas. Paul Berenson's pointillistic/Impressionist oil paintings are in privale collections around the world, including the downtown Los Angeles Athletic Club and have appeared in numerous publications, including the New York Philharmonic Playbill. PaulB.com also builds websites and PaulB is a member of the LA Web Professionals Group.